One of the most original and beloved Western entertainers of our time, Sourdough Slim is a hoot to say the least. The moment this award winning Western showman steps into the spotlight, it’s apparent to everyone that they’re in for a rollicking good time. Ten gallon funny-man Sourdough Slim, transports us to a whimsical world where vaudevillian camp and cowboy lore intermingle to produce grins galore. Slim, aka Rick Crowder, is a well traveled veteran of stages ranging from The National Cowboy Poetry Gathering to The Lincoln Center’s Roots of American Music Festival and the Carnegie Hall Folk Festival. 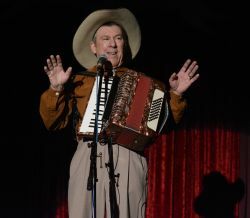 His fast-paced stage show finds him crooning Western classics, playing accordion, guitar and harmonica, dishing out hilarious comedic sketches and letting loose with some absolutely mind boggling yodeling.